Last week, over on the Plum Street Samplers blog, I said that I had been waiting for what seems like forever for snow to arrive in Omaha. When it finally did, I celebrated by making these wonderfully cozy muffins, which made my whole house smell like Christmas! I chose to use gluten-free flour (my favorite is Domata Living Flour) and they turned out no different in flavor or texture than a muffin recipe that uses regular flour. If you click on the link above, you can print it out on either cardstock or regular paper, and then cut it down to fit into your recipe box. Pumpkin Muffins and a Giveaway! Mom and I are giving away a $55 (one time use) gift certificate from CSN Stores to one person who leaves a comment here on this blog, this post. After you've left your comment, go whip up these fabulous pumpkin muffins from Marsha (hi, mom) and while you're enjoying one with butter and hot coffee, take a look at all the stuff that CSN Stores has to offer! Cream together sugar and butter. Add eggs and beat well. In a separate bowl, combine flour, baking powder, cinnamon, and salt. In yet another bowl, combine pumpkin and whipping cream or milk. Add flour mixture and pumpkin alternately to creamed mixture, beating well after each addition. Spoon into paper liners. Then combine about 1/2 c. of brown sugar and some chopped pecans. 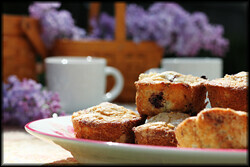 Top the muffins with as much as you want. Bake at 350 degrees for about 18 minutes, but make sure they are done. 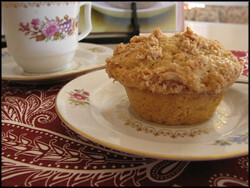 I think this was one of the first muffins I made for our brunch, like 10 years ago! I never get tired of it, but I only make it in the spring and summer, mainly due to the fact that we don't have too many fresh berries in the heartland in the wintertime. Mix together the flour, cinnamon, baking soda, and salt. In a separate bowl, beat together vegetable oil, eggs, sugars, and vanilla. Add the dry ingredients to the liquid ingredients and mix gently until moistened. Stir in the strawberries and pecans. Either grease, spray, or line muffin pan with paper liners. Using an ice cream scoop makes the perfect amount for the cups, so I put 1 scoop in each cup. Bake at 375 degrees for 20 to 25 minutes. Cool a few minutes and then put on wire rack to finish cooling. Soften butter and mix in sugar and cinnamon. ETA: I'm glad you posted this recipe, Mom, bc these are HANDS DOWN the best muffins I've ever had.. the cinnamon butter puts them over the top! Cream the butter, sugar, and vanilla. Add eggs, beating well. Combine the flour, baking powder, and salt; stir into creamed mixture, along with the milk. Fold in the blackberries. Delicious! And oh, so simple.